Do You Wonder How Many Correctional Nurses Are Out There? I renewed my nursing license this week and was reminded of how isolating the specialty of correctional nursing can feel at times. As part of the online renewal process I was asked to provide information about my work location and practice area. A correctional facility was not among the choices available for work location. Nor was correctional nursing among the choices for practice area. There was an option of writing this information in the “Other” category. This is what I chose to do but only after wondering whether it was going to be worth it. Have you had this kind of an experience? The task group that revised the Correctional Nursing: Scope and Standards of Practice (American Nurses Association, 2013) went to some effort to identify how many nurses practiced in correctional settings. While the Forum of State Nursing Workforce Centers recommends that correctional facility be listed as an employment option for data collected about the nursing workforce there is little evidence that this recommendation has been acted upon. My own experience this week is consistent with this conclusion. When you renew your nursing license is there an option to indicate that you work in a correctional setting? 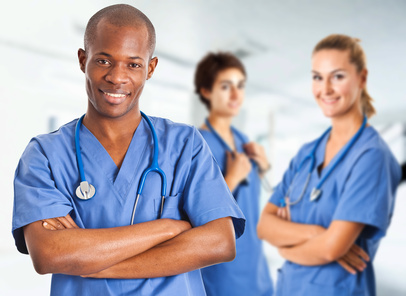 The best source of data the ANA task group found was from the Health Resources and Services Administration (HRSA) which reported in 2008 that 20,772 registered nurses or 0.8% of all registered nurses identified a correctional facility as their employment setting. The ANA task group identified several reasons why the HRSA estimate under represents the number of correctional nurses. What do you think are the reasons correctional nursing is under represented? I recently purchased The American Nurse by Carolyn Jones (2012) which is a beautiful coffee table book of 75 portraits of nurses. The purpose of the book is to celebrate the role of the nurse in the health care system by capturing and sharing the images and stories of nurses from all across America. I wondered if these 75 nurses were a representative sample of working nurses, how many would be correctional nurses? The results surprised me. Four of the nurses or five percent of the sample portrayed in The American Nurse identified themselves as providing health care in a correctional facility. This means that an estimated 131,750 nurses were working in a correctional setting at the time of the 2008 HRSA report (a lot more than 20,772)! Another nurse portrayed in the book, Sharon Kozachik, described working as a prison nurse early in her career. She is now a nurse researcher and assistant professor at the Johns Hopkins University. They have a combined total of 40 years of correctional nursing experience in Kentucky, California, Louisiana and Michigan. Four of the nurses worked in prisons and one in juvenile detention. In the interviews they talk about why they got into correctional nursing, the importance of being a role model, the challenge negotiating for patient needs in the custody setting, and how the work affects their lives. One is a Certified Correctional Nurse Manager; this is the exam Lorry wrote about studying for and just passed! It was a rich and exhilarating experience to read about nurses in all kinds of practice settings making such a difference in the lives of patients and their families. I was proud to see evidence that correctional nursing has attained a rightful place among the healers in our community. To order a copy of The American Nurse go to www.welcomebooks.com/americannurse. Proceeds from the sale of the book support a scholarship fund for nurse education. Read more about the profession in Chapter 19 of the Essentials of Correctional Nursing. Order your copy directly from the publisher; use promotional code AF1209 for $15 off and free shipping. This entry was posted in Professional Practice and tagged American Nurses Association, ANA, Catherine Knox, CCN/M Certification, correctional nursing, prison nurse. Bookmark the permalink.